I signed up for Simply Watercolor – create fun and easy watercolor cards from scratch!, an all-new card class from Online Card Classes. Artist and illustrator Kristina Werner walks you through 19+ card designs using just watercolors and basic supplies. Each card featured in class comes with a complete video tutorial and downloadable instruction file in PDF format. 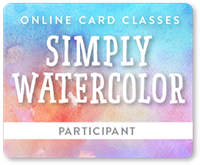 Visit Online Card Classes – Simply Watercolor for details. I have taken a couple of watercolor classes before, but they focused on creating full-fledged paintings based on a drawing. While these classes were helpful, they were a bit overwhelming as I am not a traditional “artist” and do not “draw” stuff. I am not inspired to take up “painting” as a hobby, plus I have no more wall space in my home to hang any finished paintings I may have created. I found that I prefer applying watercolors in a smaller and less structured medium such as greeting cards. Also, I can give, donate, or sell the greeting cards I create, so no post creation storage issues. I am looking forward to these classes by Kristina Werner. She is a wonderful and creative person with a great presentation and teaching style. I will be posting my “homework” creations as I progress through the classes.